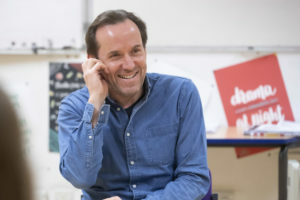 British comedy actor and author Ben Miller has told Cramlington drama students that the acting profession is crying out for people like them. 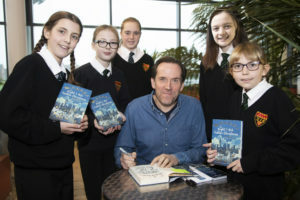 The star of Johnny English Strikes Again, Paddington 2 and Death in Paradise visited Cramlington Learning Village to talk about his first children’s book, The Night I Met Father Christmas. But first he provided a dozen drama students with an insight into his life as an actor. It started when he was a student at Cambridge studying physics and had a part in Othello. He said that even though it was a serious role people laughed every time he came on stage and that set him on the path to a career in comedy. Now an established star, he believes areas like the North East should be better represented in film and on television. He is a regular visitor to the region because of his friendship and working relationship with Pointless host Alexander Armstrong, who grew up in Longframlington in Northumberland. Out of all of his work Ben said he was most proud of their comedy sketch show, Armstrong and Miller, which ran on television for three years until 2010. The partnership was revived last month in a special gala at the London Palladium to celebrate Prince Charles’ 70th birthday and – Ben revealed – that the pair are thinking about other ways to collaborate. At the moment, though, he is concentrating on promoting his book through appearances on national television and radio as well as visits to schools. The Night I Met Father Christmas was written for his oldest son Jackson and tells the story of what happened when a 10-year-old boy – who has been told Father Christmas does not exist – decides to stay up on Christmas Eve to find out for himself. Father Christmas does come down the boy’s chimney, of course, but is so surprised to see him he falls over and sprains his ankle. The boy then has to help Father Christmas deliver his presents and, during their journey, learns the true story of how he became Father Christmas. “As an adult, reading is an enormous pleasure but we tend to be familiar – on some level – with the worlds that we discover in books. For children all these worlds are new. It’s really, really great for their development,” said Ben. 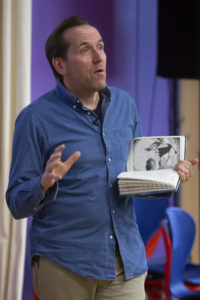 Many of those authors have visited Cramlington Learning Village in recent years and shared their enthusiasm for story-telling and reading with the students. The school’s librarian Eileen Armstrong said: “The students – and staff – were so excited about Ben’s visit and he didn’t let us down. He spent hours speaking to students, signing books and smiling for photographs. 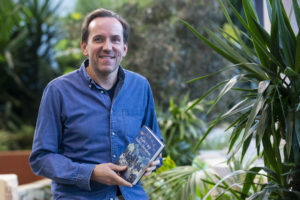 “Seven Stories – The National Centre for Children’s Books – in Newcastle has helped us attract many of the writers who come to the school and they know they are going to have an attentive and enthusiastic audience here.